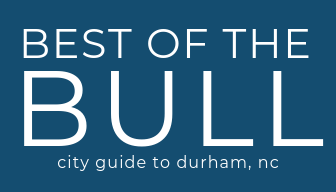 To help mark his 15th birthday during Durham’s year-long sesquicentennial celebration, the community’s beloved Major the Bull sculpture in CCB Plaza will be receiving new, bronze signage, in both English and Spanish, and the Bull City is invited to the celebration. Hosted by the City of Durham and Liberty Arts, the event will take place in front of the Bull sculpture at CCB Plaza, which is located at the corner of North Corcoran and West Parrish streets in downtown Durham, on Friday, April 12 at 11 a.m.
At this event, community members will have the opportunity to meet the artist team behind the sculpture, Leah Foushee Waller and Mike Waller, and hear them speak about creating the Bull, and what the sculpture means to Durham today. Mayor Steve Schewel also will speak and Liberty Arts representatives will be giving out free cupcakes. The sculpture, titled Major the Bull, was cast in bronze and created from start to finish in Durham at Liberty Arts, a studio and foundry dedicated to enriching our communities with arts experiences that inspire, empower, educate, and entertain. The sculpture and plaza were gifted through a grant by the Central Carolina Bank to the residents of Durham. The statue depicts a bull, a symbol for Durham since the 1800s, and stands 10 feet tall. The monument reinforces the strong qualities of the city and its residents, even in the face of negative perceptions of the area. Signage will include a bronze plaque in both English and Spanish with information on the artists, creation date, and where the sculpture was created. The Durham Audio Described Art (DADA) Project will be providing ADA-accessible signage with call-in information for those with visual impairments to hear a description about the sculpture. Leah Foushee Waller and Michael Waller are two artists who were involved in the early years of Liberty Arts, and founded their business WallerFoushee Studios in 2003, subsequently creating over a dozen public art projects throughout North Carolina in addition to exhibiting their personal artwork. Michael continues to serve on the board of directors of Liberty Arts, and recently launched a solo project “Waller Handmade” – a functional, hand-crafted culinary art venture. In addition to sculpting, Leah has been an art educator for nearly 15 years, teaching art at the elementary and middle school levels. They currently live in Hillsborough, N.C. with their two children. For more information about this public art installation or its opening ceremony, contact Special Projects Manager Stacey Poston with the City’s General Services Development at (919) 560-4197, ext. 21254 or Stacey.Poston@durhamnc.gov.